This was the motto for 2015 in Austria again and 224 kindergardens, schools and children daycare centers participated. 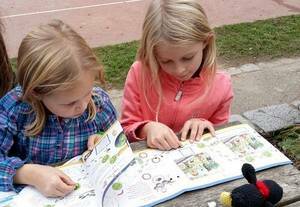 Over 23,600 children collected environmental friendly ways for the climate. 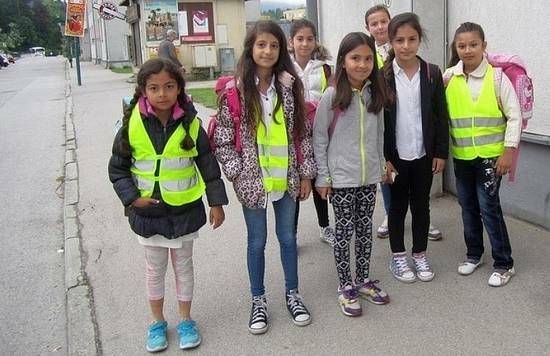 At the practice primary school of the educational academy Steiermark, „road-crossing guards“ were trained in a 4th grade. Two kids were equipped with reflective vests and handheld stop signal and, supported by a teacher, were helping the other children to cross the street to the park or the library safely. Each month they were switching so that evey child of the class got the opportunity to undertake this task. 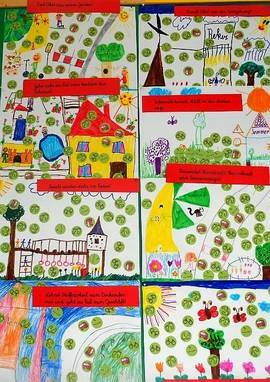 The children of Frastanz not only collected green footprints diligently, but also made great footprint posters. These show on which topics the children had been working. A special fancy interpretation shows the poster with the “bicycle faces”. 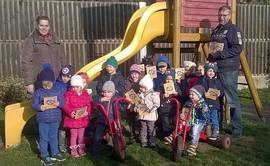 At the school “VS Moosdorf” not only the children collected green footprints but also the teachers. Furthermore, they baked delicious cake. Single-handed, the children of the primary school Pernitz built “Walking groups”. Each of these received a pedometer. Those who wanted, also received a reflective vest. Especially the younger pupils had much fun with the reflective vests. The children had that much fun that they convinced their parents to collect green footprints also during the weekend. Within the framework of the holiday program, green footprints had been collected in Scheibbs also during the summer holidays. The winner had been awarded now by mayor Christine Dünwald and councilor Johannes Hofmarcher during a small ceremony in the town hall. Federal Minister Rupprechter welcomed the summer winner of the Austrian Green Footprint Action, the school VS Pergkirchen in Upper Austria. 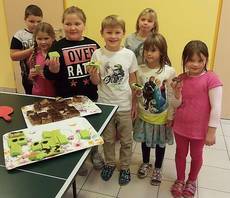 Numerous schools and kindergartens from all over Austria are also participating this year in the “Kids on the Move” campaign, in Austria being organized by Climate Alliance Austria (funded by the Ministry for a livable Austria). Now, it was time to take stock. During that, the most diligent educational institution was chosen: the VS Pergkirchen in Upper Austria, which, by the way, since the last school year, is also Climate Alliance School. 63 children from all 4 classes have been collecting 894 green footprints for 5 days and additionally to that collected 141 in their spare time. But they did not only abandon the parents taxi, but also the bus. The committed teachers collected the children from the bus stops and were walking to school. In doing so they did 900 km by foot in one week. The children and teachers were awarded by Federal Minister Andrä Rupprechter in the presence of DI Petra Völkl, DI Robert Thaler (both Ministry for a livable Austria), regional manager Alois Ometzberger (ÖBB Postbus GmbH), district’s school inspector Notburga Astleitner, as well as Peter Molnar (managing director of Climate Alliance Austria). As reward for the diligent collecting of green footprints, they received a visit to the zoo Schönbrunn. Like every year, a climate friendly ÖBB postbus was used for the journey. It was provided free of charge. The children returned the favour by presenting songs and a self-created poem. 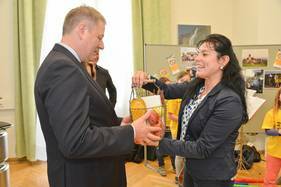 Finally the School principal Georgine Wagner handed over a regional basket of delicacies to Federal Minister Rupprechter. To school by foot, by scooter or by bike. This is an important topic at the school VS Laa an der Thaya. For this they have been awarded as winner in the eastern region of the Kids on the move campaign in Austria. Plus they were awarded with the visit of Tramwaymuseum in Vienna. 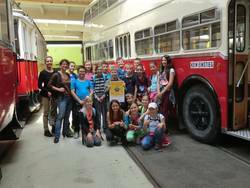 The transport association Verkehrsverbund Ostregion with the support of Vienna transport Wiener Linien invited the collectors of green footprints. 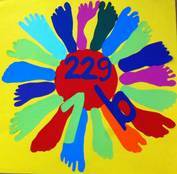 During 105 days, 206 children of all 11 classes of VS Laa an der Thaya collected 19,985 green footprints by using ecofriendly ways to school. “Most of the schools are participating from 1 to 4 weeks per year. VS Laa sets a good example and had been participating for half a year. Surely one factor of success is the fact that the association of parents is standing behind this campaign”. Says Martina Daim of Climate Alliance Austria.